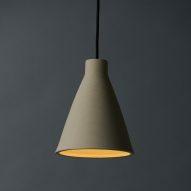 This delicately ridged pendant light by Australian designer Tom Fereday and artist Susan Chen takes two and a half hours to 3D print from one piece of extruded clay. 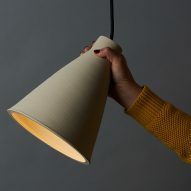 The lamp is made using a ceramic printer, developed by Chen during a masters spent researching the possibilities for 3D-printing ceramics. It's one of only a handful of its kind in Australia. 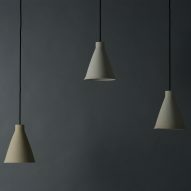 The Pelo light features a conical shade with minute furrows created as the clay is coiled on top of itself. These are emphasised when the light is turned on. "I was struck by how elegant the fine detail and natural variation of the process is, and wanted to celebrate this through a design that would highlight and celebrate the process in its own right," Fereday told Dezeen. 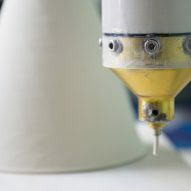 "We attempted to use our experience to create a product that was driven by the process of 3D printing, and not simply made to create a shape that might otherwise be too complex to make." 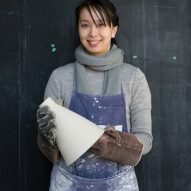 Fereday took responsibility for designing the lighting, including modelling, components and assembly, and Chen oversaw its development, making sure it could be produced using 3D printing. 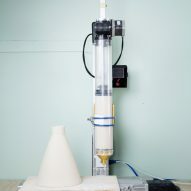 The pair tested a number of prototypes along the way, to understand how to prevent the shade from slumping or shrinking during printing, and to see the outcome of different materials such as earthenware and porcelain. "It was incredible to see the variations and reactions of each material with the process," said Fereday, who runs his own studio designing furniture, lighting and products in Sydney, Australia. "We were able to intimately experiment with translucency, deformation and colour." 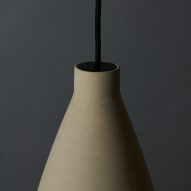 "As a light, the detailed surface is highlighted and celebrated as an honest expression of the process, which would be very difficult to replicate through a traditional ceramic-making process." 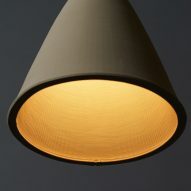 Each lamp takes around two and a half hours to print, and shades are dried for ten days before being fired and assembled. 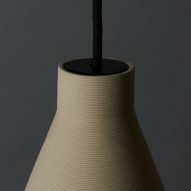 Eindhoven designer Olivier van Herpt has also experimented with 3D printing ceramics, creating a series of functional objects as well as a set of vases based on a COS fashion collection. Photography is by Fiona Susanto.